I am in utter heaven now that we are firmly in autumn, the leaves are no longer tinged with gold but crunchy underfoot, skies a wash of blue but with a chill in the air and boots a necessary footwear staple. There’s that misty rain, the kind my hair hates which makes straightening it utterly pointless so a bobble hat with an outrageously large pom pom is permanently in my handbag. Bundles of coppery, plum, burgundy and red nail varnishes have replaced the pastels and I’ve stepped out of my make up comfort zone to finally start wearing lipstick, pleasingly colouring the rim of a coffee cup each morning. I’ve become obsessed with candles, tealights in rose gold holders, a large jar of sage and cardamom in the corner with a relaxing lavender the newest addition to my collection. There’s fairy lights and blankets and the threat that any moment now, my baby soft reindeer onesie will make an appearance and once that thing goes on it isn’t coming off until spring. I’m one of those girls, I admit it. I bloody love this time of year. The lashing rain I could do without, alongside my hair rounding into cows licks and that time last week where the soles of my boots literally disintegrated into winter flip flops, hobbling round Primark until I could find a suitable replacement to keep my toes dry. But even rain has its advantages and there’s nothing quite like knowing it’s horrendous weather outside but your inside, hearing the wind whipping at the windows and fat raindrops soaking the pavements. In your hands should be something hot and soothing and right now that should be homemade hot chocolate, made with two fat squares of 70% and a tablespoon of milk chocolate chips, warming spices and a kick of chilli, warmed in a pan with almond milk then topped with two bobbing vanilla ghosts, slowly melting into pools on top, like sea foam on toasty sweet chocolate waters. I love themed bakes and way before Pinterest my mam was making traffic light biscuits with smarties, sandwiches with flower shaped biscuit cutters and marshmallow hedgehogs, a sort of hodge-podge condensed milk-biscuit-cherries-nuts no-bake thing that was one of our favourites. 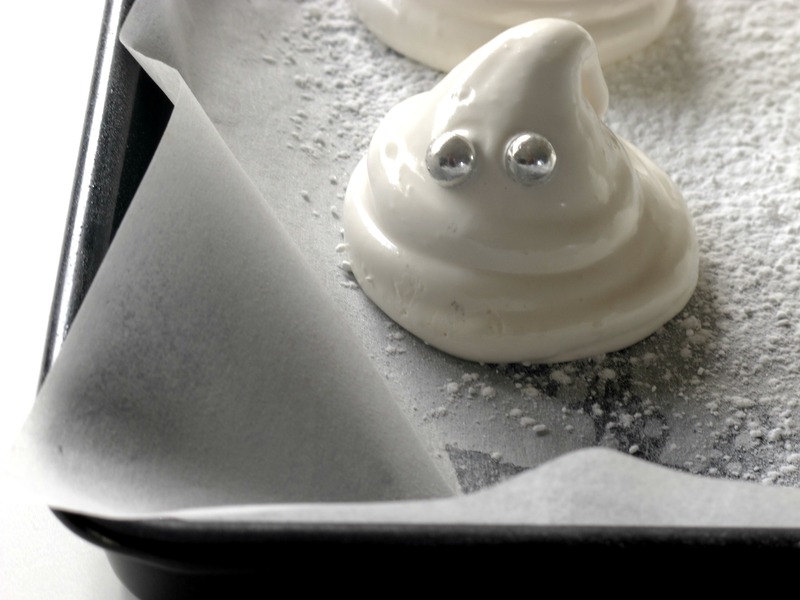 Since the only thing I have to appeal to is C and I’s childish sense of humour rather than a five-year-old, I decided hot chocolate marshmallows should at least be ghost shaped for the Halloween month of October. I played Monster Mash and piped around 40 little ghosties, who my friend Laura pointed out looked like nice versions of Slimer from Ghostbusters. Since green marshmallows are a bit too far even for my gaudy novelty tastes, I gave these spooky sweeties a silvery sheen with lustre spray and two rather expressive eyes using silver cake decorations. They are a doddle to make and perfect if, like me, you plan to spend Halloween watching scary movies cosied up on the sofa whilst all the shenanigans happen outside. I’m just going to have a standby bowl of haribo for trick or treaters, since I’m going to be greedy and keep these all to myself. You can easily turn this recipe into a standard marshmallow block to slice into squares. Simply grease a 20cm square tin, line with parchment and dust with the cornflour and icing sugar mix then pour in the marshmallow. Set for four to five hours then cut into cubes with a lightly oiled knife. 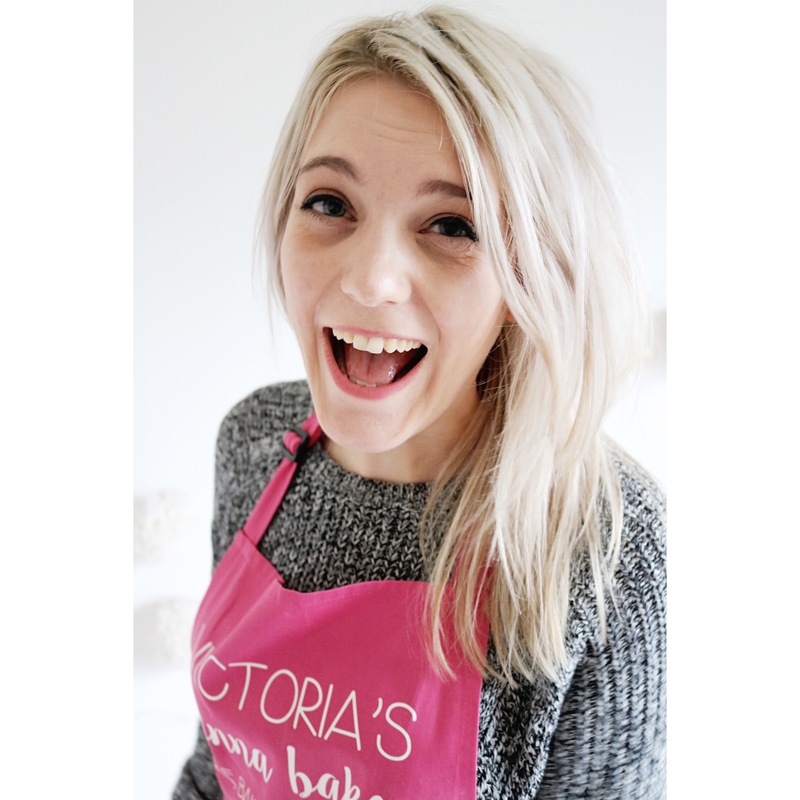 In a bowl, whisk together the cornflour and icing sugar. Lightly coat two baking trays with oil and line with baking parchment. Coat again with oil (I used sunflower oil spray which makes this really quick) then sift over the cornflour and icing sugar mixture in an even layer across both trays, reserving some for storage. Soak the gelatine leaves in a bowl of cold water to soften and then place the egg whites and two tablespoons of the caster sugar in the bowl of a stand mixer fitted with the whisk attachment with a pinch of salt. In a saucepan, combine the remaining sugar with the golden syrup and water then place over a medium heat with a sugar thermometer. Heat the mixture to 110oc then start whisking the egg whites on high. Once the sugar syrup reaches 115oc, remove the pan from the heat. Squeeze the water out of the gelatine leaves then quickly stir into the sugar. With the mixer running on medium, carefully pour the syrup into the egg whites and add the vanilla paste. Whisk on high until the bowl is at room temperature. Prepare two disposable piping bags by placing in pint glasses and folding over the top. 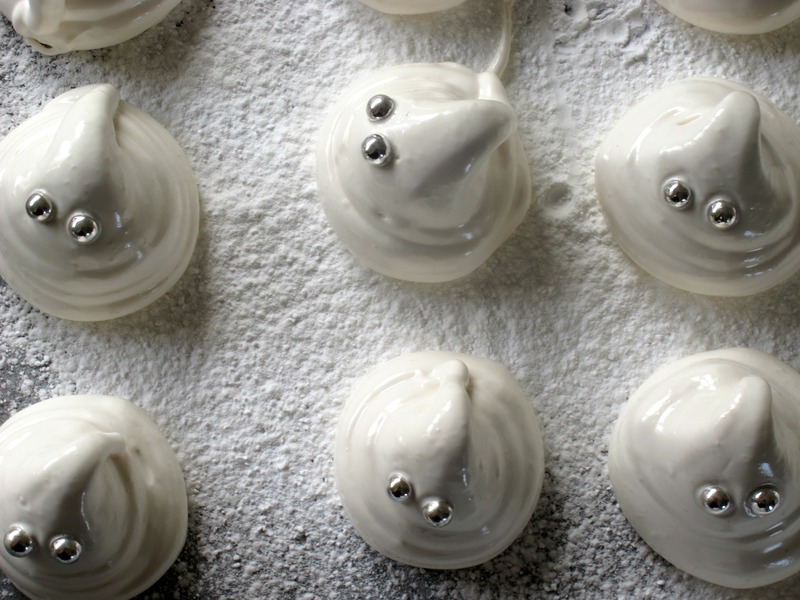 Once the marshmallow is stiff and shiny, leaving a little trail when the whisk is lifted, divide between the two piping bags, smoothing the mixture down and twisting at the top. Take one of the piping bags and snip off an opening around 1cm and pipe vertically, pushing and slackening the pressure to create little folds then lift up sharply to create the ghost head. Repeat with the remaining mixture, swapping to the second bag when needed to create around 40 mini marshmallow ghosts. Press two silver balls into each one to create the eyes and spray with lustre if using. Leave to set for around 1 to 2 hours then carefully lift off the paper and arrange on a cake stand if serving as little sweets or place on top of hot chocolate. To store, sift over the remaining cornflour and icing sugar mix to prevent them sticking together and store in an airtight container for around three days. Aww these are fabulous, bookmarking as i will be making these with the kids! Thanks Deborah, I hope your kids enjoy making these little ghosties – perfect for melting on top of a mug of hot chocolate! 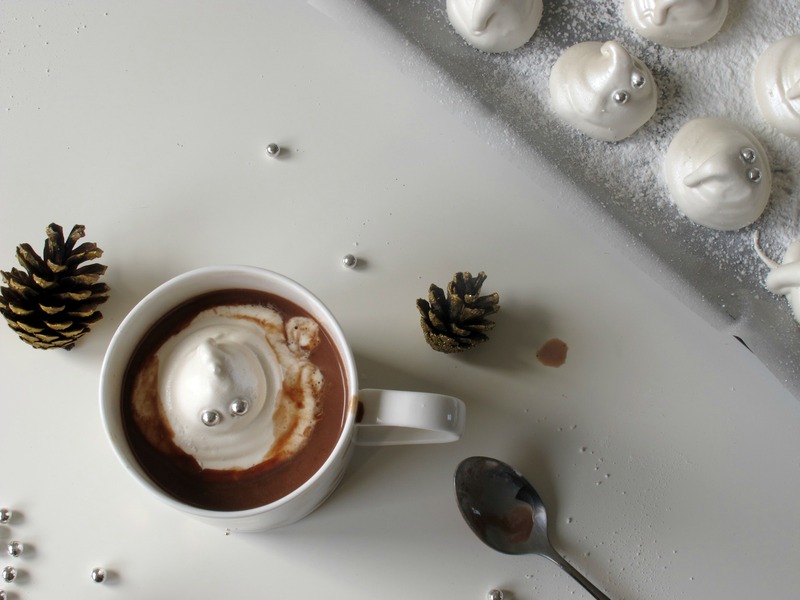 I’ve never made marshmallows before, but these are ridiculously cute, so I may just give it a try! Thanks Jen, they are super easy to make and look so cute slowly melting on a mug of hot chocolate! what a beautifully written post-what a way to paint a picture with words! 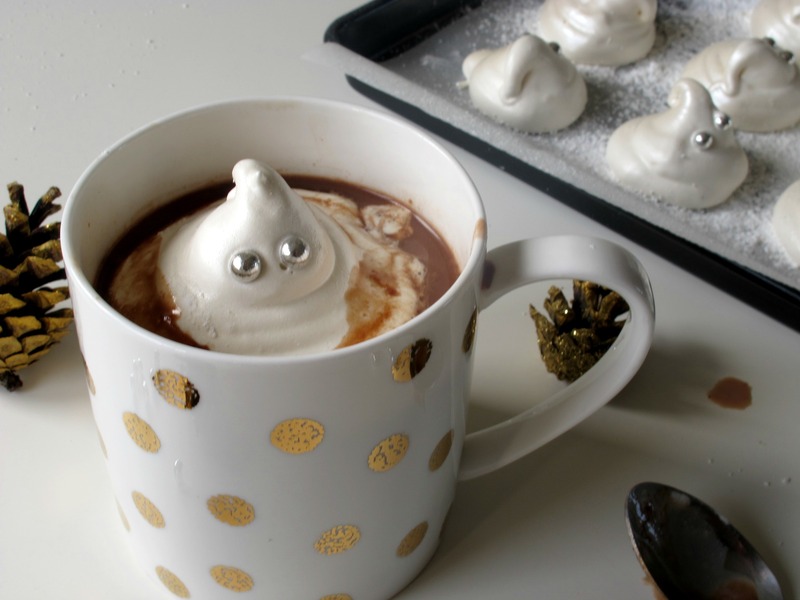 Not to mention how adorable those little ghosts are-would love to try this! Thank you Alexis, that’s such a kind comment! I hope you do give them a try, they are deceptively easy! Thanks Ruchi, a couple of my friends have made them and put them in a coffee and they taste just as delicious as they do in hot chocolate! Thanks Kay hope you enjoy them! These are so cute! Love the festive treats! Thanks Rachel, they’re perfect for this time of year!